Kristi Dean presented back-to-back seminars to the Independent Insurance Agents and Brokers of Orange County (IIAB-OC) today, August 9, 2018. Both presentations were offered in-person in a classroom setting and online via webinar. Qualifying attendees received 3-hours of Continuing Education credit for their attendance. Your next opportunity to hear from Kristi and earn CE Credit will come in November. 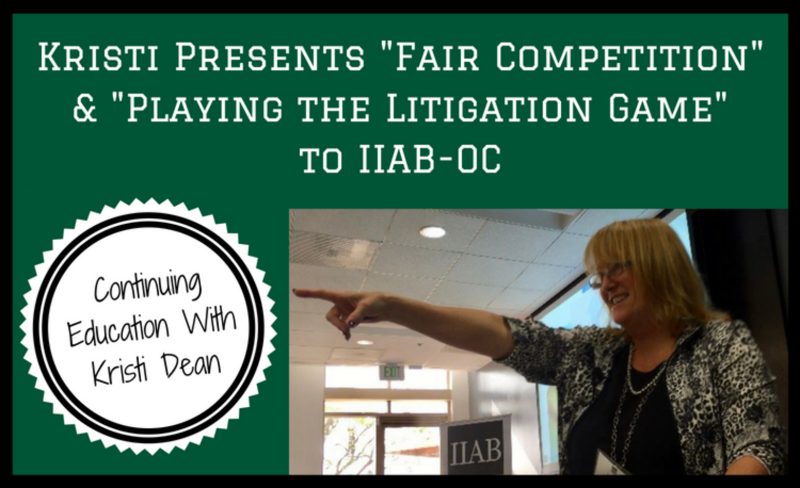 Stay tuned for announcements and sign up for the Stone | Dean newsletter to make sure you never miss events and important news from S | D.
The presentation of Fair Competition taught attendees the ins and outs of fair and unfair competition laws in the insurance industry. From hiring competition employees to trade secrets and false advertising, insurance professionals in attendance were educated on how to protect their proprietary information, and what to do if it gets in to the hands of a competitor. Insurance professionals need proper documentation in their underwriting files in order to defend themselves successfully from errors and omissions claims. The presentation of Playing the Litigation Game educated attendees on avoiding E&O claims through proper documentation and effective communication, arming them with the tools they need to protect their business from unnecessary claims. Interested in more learning opportunities with CE-Credit? You can find a full list of Kristi’s California Department of Insurance Approved seminars by clicking here. Contact Stone | Dean at (818) 999-2232 for more information on booking a seminar for your organization.